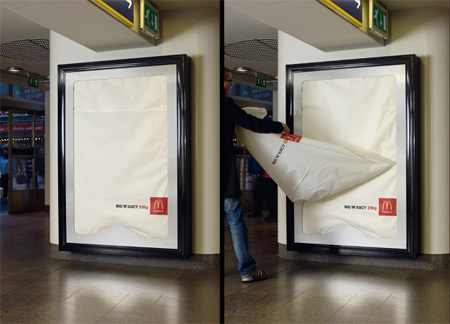 Giant paper napkins were used to promote McDonald’s largest hamburger ever, the Big’n’Juicy, in Stockholm, Sweden. 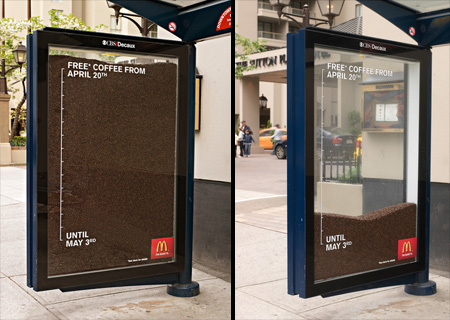 Transit shelter in Vancouver was turned into an ‘hourglass’ filled with coffee beans, reminding customers of the promotion’s short-term nature. 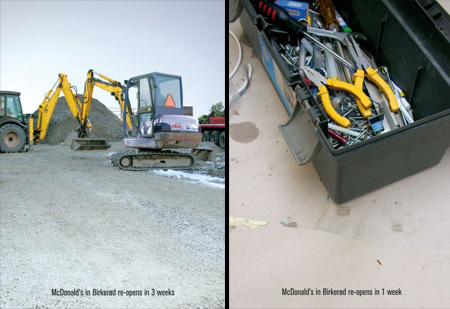 Creative ads for McDonald’s re-opening in Birkerod, Denmark. 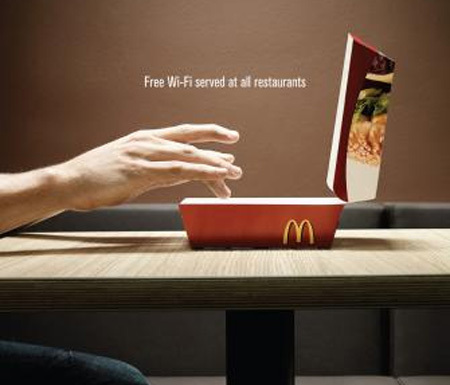 Free Wi-Fi served at all McDonald’s restaurants. 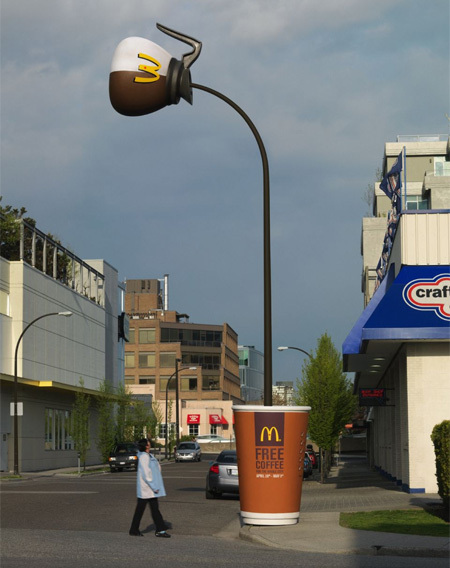 Lamppost in downtown Vancouver became part of a clever optical illusion, appearing to pour coffee into a giant cup on the sidewalk. 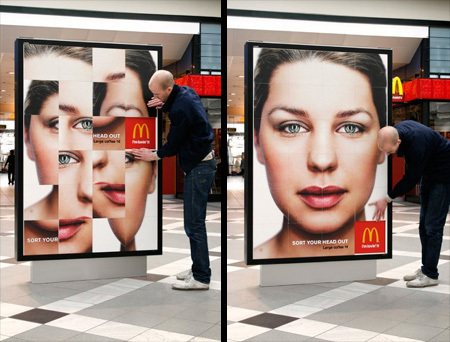 These are really one of the best and most clever advertising I’ve ever seen. Love the sundial and the bus shelter! Very creative in terms of functionality. Mm… Very deliciously creative! Great finds. Full of creativity, life and energy – good job! 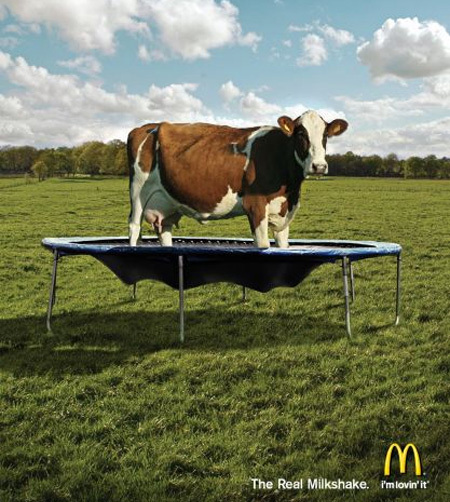 it’s amazing how much advertising mcdonalds and coca-cola etc do, when they’re pretty well known and everywhere. Sweet/strange. 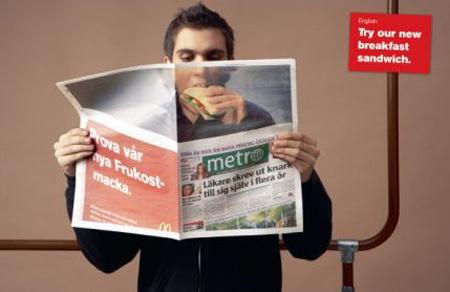 I live in Stockholm and hasn’t seen any of these Swedish adverts. Best thing to come out of McDonalds since they invented the “Golden Arches”!!! 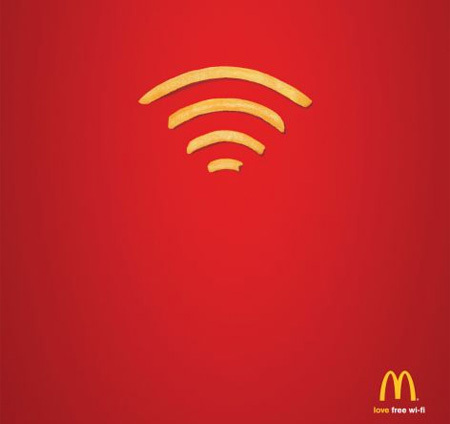 Some very smart ones.. though I’ve seen the bigmac box wifi ad in another form once. Wow! it’s awesome, and of course… I’m hungry now! Wow, the lamp post is brilliant! well, that is some creative advertising! and it makes me hungry for big mac! i can feel how they are delicious by eyes.it’s lifeslike. 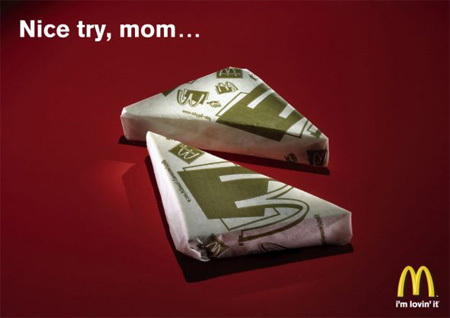 These McDonalds ads are so much better than the ones I see in Seattle. these impress me a lot ! oh, you make me hungry , your image ads are great! 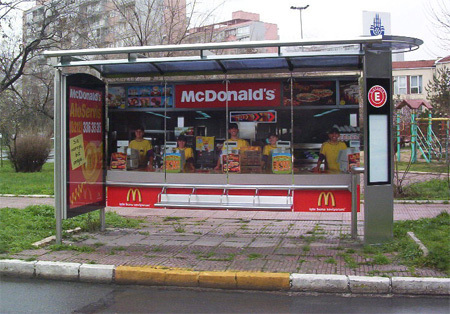 It’s really wise to use advertising billboads in puplic places.They will attract more new customers.For example,when you wait for a bus at the bus top,you can look at the beautiful pictures on advertising McDonald,image a delicious meal and maybe you will want to try it immediately.I also appreciate McDonald’s Free Coffe Hourglass.It is given away free for a two week period in an effort to promote its brand.In my opinion, the way is really practical and effective.And others campaigns is also creative and attractive.All makes the success of McDonald. i like the last most!! !i’m very surprised by that. it is so beautiful:X. and i hope it will be in vietnam as soon as possible! McDonald’s is one of the world’s most recognizable brands. 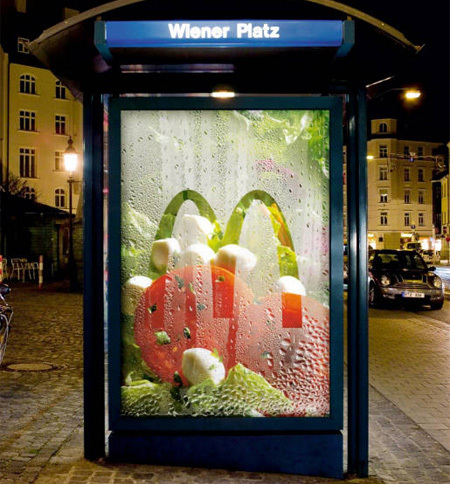 This is a great collection of ads, thanks for sharing cool and unusual stuff on your blog. Congrats. 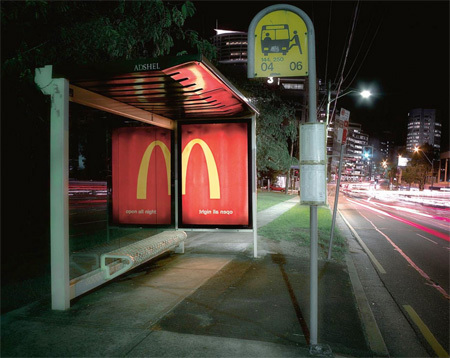 Truly creative ads! I can’t believe the made a sundial! Those pics were really “out-of-this-world”!!! I think the one’s that held in impact in my mind were the giant napkins… the pie billboard… and the coffee street light! Although…they were fabulous! Thx! 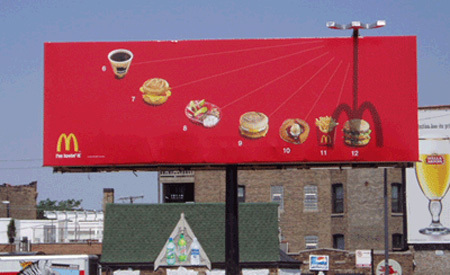 I love mcdonalds these ads are so creative i like the billbored the most and the coffee hourglass thing. woooooooow i like those creative ads!!!!!!!!!!!!!!!!! Why are all the unique ads not where I live? These are so cool! 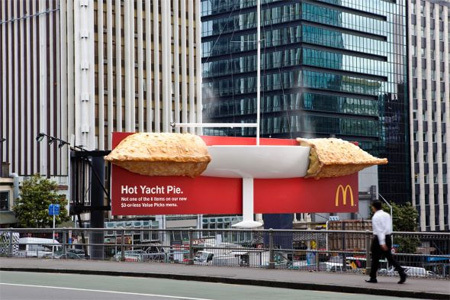 Very creative, but outdoor advertising is visual spam. It ruins our cities and towns – and it’s the only form of advertising we can’t opt out of. I’m pro marketing and advertising (it’s my business too). But outdoor should be illegal. Sao Paolo banned it — and the population loves it. 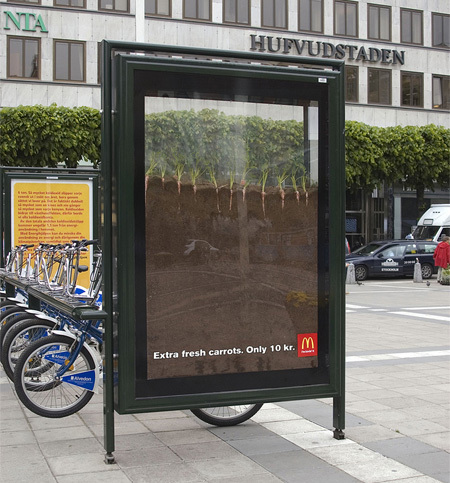 As the world’s largest outdoor advertiser, McDonald’s is the biggest perpetrator. Love the burgers. Hate the billboards.